Brent crude oil spot prices averaged $72 per barrel (b) in April, an increase of $6/b from the March level and the first time monthly Brent crude oil prices have averaged more than $70/b since November 2014. EIA forecasts Brent spot prices will average $71/b in 2018 and $66/b in 2019, which are $7/b and $3/b higher, respectively, than in the April STEO. EIA expects West Texas Intermediate (WTI) crude oil prices to average $5/b lower than Brent prices in both 2018 and 2019. NYMEX WTI futures and options contract values for August 2018 delivery traded during the five-day period ending May 3, 2018, suggest a range of $54/b to $84/b encompasses the market expectation for August 2018 WTI prices at the 95% confidence level. For the 2018 April–September summer driving season, EIA forecasts U.S. regular gasoline retail prices to average $2.90/gallon (gal), 17 cents/gal higher than in last month’s STEO and up from an average of $2.41/gal last summer. The higher forecast gasoline prices are primarily the result of higher forecast crude oil prices. 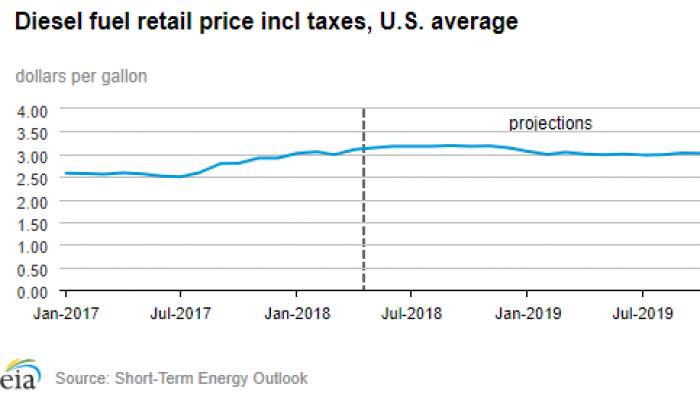 For the year 2018, EIA expects U.S. regular gasoline retail prices to average $2.79/gal. Monthly average gasoline prices are forecast to reach a summer peak of $2.97/gal in June, before falling to $2.86/gal in September. EIA estimates that U.S. crude oil production averaged 10.5 million barrels per day (b/d) in April, up 120,000 b/d from the March level. EIA projects that U.S. crude oil production will average 10.7 million b/d in 2018, up from 9.4 million b/d in 2017, and will average 11.9 million b/d in 2019, 0.4 million b/d higher than forecast in the April STEO. In the current outlook, EIA forecasts U.S. crude oil production will end 2019 at more than 12 million b/d. EIA forecasts that total crude oil and petroleum product net imports will fall from an annual average of 3.7 million b/d in 2017 to an average of 2.6 million b/d in 2018 and to 1.5 million b/d in 2019, which would be the lowest level of net imports since 1958. EIA estimates global petroleum and other liquid fuels inventories declined by 0.5 million b/d in 2017. In this forecast, global inventories grow by 0.2 million b/d in 2018 and by 0.6 million b/d in 2019. U.S. dry natural gas production averaged 73.6 billion cubic feet per day (Bcf/d) in 2017. EIA forecasts dry natural gas production will average 80.5 Bcf/d in 2018, establishing a new record. EIA expects natural gas production will rise again by 2.9 Bcf/d in 2019 to 83.3 Bcf/d. Growing U.S. natural gas production is expected to support increasing natural gas exports in the forecast. EIA forecasts net natural gas exports to increase from 0.4 Bcf/d in 2017 to an annual average of 2.0 Bcf/d in 2018 and 4.6 Bcf/d in 2019. EIA estimates that natural gas inventories increased by 22 billion cubic feet (Bcf) in April, ending the month 27% below the five-year average for the end of April. If confirmed in the monthly data, the April 2018 injection would be the smallest April injection since 1983. Preliminary data indicate April temperatures were the coldest for that month in the past 21 years, which contributed to low injections. Based on EIA’s forecast of rising production, natural gas inventories should increase by more than the five-year average rate of growth during current the injection season (April–October) to reach more than 3.5 trillion cubic feet on October 31, which would be 8% lower than the five-year average for the end of October. EIA expects Henry Hub natural gas spot prices to average $3.01/million British thermal units (MMBtu) in 2018 and $3.11/MMBtu in 2019. NYMEX futures and options contract values for August 2018 delivery that traded during the five-day period ending May 3, 2018, suggest that a range of $2.32/MMBtu to $3.40/MMBtu encompasses the market expectation for August 2018 Henry Hub natural gas prices at the 95% confidence level. EIA expects the share of U.S. total utility-scale electricity generation from natural gas-fired power plants to rise from 32% in 2017 to 34% in both 2018 and 2019. The forecast electricity generation share from coal averages 29% in both 2018 and 2019, down from 30% in 2017. The nuclear share of generation was 20% in 2017 and is forecast to be 20% in 2018 and 19% in 2019. Nonhydropower renewables provided slightly less than 10% of electricity generation in 2017 and are expected to provide more than 10% in 2018 and nearly 11% in 2019. The generation share of hydropower was 7% in 2017 and is forecast to fall slightly below that level both 2018 and 2019. EIA forecasts coal production to decline by 3% to 751 million short tons (MMst) in 2018. The production decrease is largely attributable to a forecast decline of 4% in domestic coal consumption in 2018, with most of the decline expected to be in the electric power sector. A 9% forecast decline in coal exports also contributes to lower expected coal production in 2018. EIA expects coal production to remain nearly unchanged in 2019 at 752 MMst. In 2017, EIA estimates that wind generated an average of 697,000 megawatthours per day (MWh/d). EIA forecasts that wind generation will rise to 741,000 MWh/d in 2018 and to 766,000 MWh/d in 2019. If factors such as precipitation and snowpack remain as forecast, conventional hydropower is forecast to generate 747,000 MWh/d in 2019, making it the first year that wind generation would exceed hydropower generation in the United States. After declining by 0.9% in 2017, EIA forecasts that energy-related carbon dioxide (CO2) emissions will increase by 1.4% in 2018 and by 0.4% in 2019. Energy-related CO2 emissions are sensitive to changes in weather, economic growth, and energy prices.